Being well setup and well equipped is a sure fire way to make your building experience more enjoyable, and that's without even mentioning a builder's general love for having toys! Although the Kit Assembly Instructions have a list of tools, I thought I would share my experience when it comes to some tools, as sometimes finding them, or finding the right one, can be a challenge. Although you can technically possibly get away without needing an air compressor or air tools, I would strongly recommend you not "cheap out" on this setup. Pneumatic riveter, air drills, die grinders. Allows you to do many things faster. Needed for spray priming and/or painting, if you're going to do that yourself. Supposedly more energy efficient than electrical tools. Smaller tools, notably air drills, that are easier to handle and manoeuvre. In order to get the proper metal cutting RPMs, only an air drill will do. So long as your compressor is on, you never run out of power, unlike running into dead battery issues. You can build yourself a compressed air system and run piping to where you need it. If you do the above point, you can place the compressor anywhere you like! Compressed air has other uses, such as compression tests on cylinders, inflating your tires, etc. If you like to work on your home, it will also power nail guns! More expensive than just having a few electrical tools, or even manual ones. Can be quite noisy, depending on the compressor type and model, and where you place it. You have to mind the tank, drain it, turn it on and off when you need it don't need it, possibly mind the oil levels, etc. Need to oil air tools daily. It's a California Air Tools 15020c, Ultra-Quiet and Oil-Free! Fantastic piece of machinery, highly recommended. As you might have noticed, it actually lives in a small room in the basement, and is connected to the garage via a RapidAir system (You can build this from parts if you know where to source them, but I chose the kit for convenience). You can barely hear it outside that room with the door closed. Pneumatic pop-riveter: I use the Campbell Hausfeld CL153900AV 2,000 lbs. Pop Rivet Gun . Happy with it, shop around, it can be had for a fair price at Home Depot or Amazon. I ended up having to get a second pneumatic pop-riveter: I needed to up-size some holes to 1/4 inch, which my existing (above) riveter could not handle. 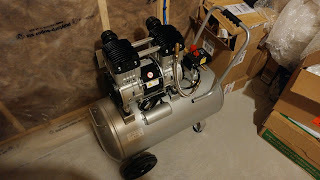 So I went to princess auto and got an air hydraulic unit (50% off!). This is an interesting find ... it uses air and hydraulic fluid. The action is very smooth and powerful. A pleasure to use when needed, though it will remain as a backup for now, since it is more heavy and bulky than the other one. Air drill: Although the Sling instructions say an electric drill will do, technically the drill speeds required for proper holes in aluminum are too high for any electric drill I've ever seen (3000+ RPMs). Also electric drills are bulky and heavy, especially battery operated ones. So, get a good air drill! I got the Pan-American Tools Nova Compact Pistol Grip Drill with chuck and key and 4000 RPM (Part 60-310).